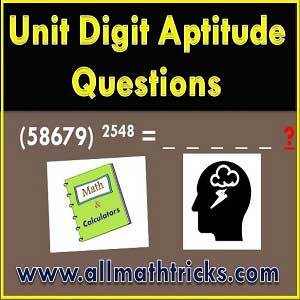 In Quantitative aptitude questions ask to find the last digit and last two digits of a power or large expressions. In this article explained different types of tools to serve as shortcuts to finding the last digits of an expanded power. The last digit of power of 1, 5 & 6 is always comes same number as a unit place. Hint: Here the pattern of the last digits are 1 , 3, 9, 7, 1, 3 , 9 , 7 . . . . . . . for the powers 4x , 4x+1 , 4x+2 , 4x+3 . . . . . respectively. It is a remainder theorem application – The last digit of an expression equals to remainder of that expression divided by 10. Hi friends Thanks for reading. I Hope you liked it. Give feed back, comments and please don’t forget to share it.